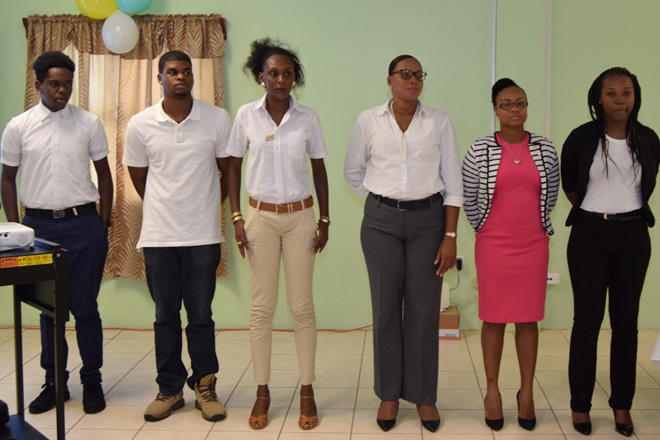 (SKNIS): Thirty (30) young persons comprising of 12 males and 18 females from St. Kitts and Nevis were inducted as Comprehensive Disaster Management (CDM) Youth Ambassadors yesterday, becoming the first cohort in the Caribbean region to serve in this significant capacity. The brief but meaningful induction ceremony was held at the National Emergency Management Agency (NEMA) Conference Room. Such an engagement of young people is being advanced by the Caribbean Disaster Emergency Management Agency (CDEMA) in Barbados to invest in young people in disaster management activities over the short-to long-term period. “Recognizing the importance of integrating youth action and involvement into the disaster management framework, NEMA and the Nevis Disaster Management Department (NDMD) jumped at the opportunity to formalize and create the St. Kitts and Nevis CDM Youth Ambassadors,” said Rohan Isles, Junior Communications Officer at NDMD. “It is the hope of the coordinators that this group through its creed will seek to educate their peers, build resilience, reduce risk, strengthen efforts of preparedness and awareness, while ensuring that all sectors of the Comprehensive Disaster Management cycle – that is mitigation, preparedness, response, recovery and rehabilitation – are at the forefront of all concerned,” he further added. Carl Herbert, National Disaster Coordinator at NEMA, said that the induction of the Youth Ambassadors “reminds us that many of our young people are prepared to be involved in meaningful activities.” He urged the youth to not just have a group on paper, as too often groups are formed without any action and implementation resulting from them. “And so I want to encourage the young people to do their best to ensure that the group not only survives, but remains active,” added the National Disaster Coordinator. Shajunee Gumbs was inducted as the President, while Tawanna Collins and Densa Tota serve as the Vice President and Secretary, respectively. Other Executive members include: Nadia Francis, Assistant Secretary; Terrance Francis, Treasurer; and Howard Liburd, Public Relations Officer.